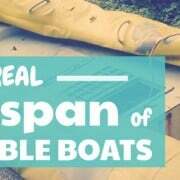 What to avoid when washing an inflatable boat? Before stacking your SIB somewhere for the winter season, you want to make sure that you store it neatly. Remove debris and dirt to prevent it from damaging your boat’s fabric while in storage. Cleaning/washing your boat before you store it away will also lessen the chances of it developing a foul odor or mold. These products will weaken, damage, and discolor your dinghy’s coating and fabric. Tip: For stubborn stains, try using a citrus hand cleaner with pumice. It might take a lot of hard work to do so, but it’s effective and it doesn’t contain any harmful and harsh chemicals. Make sure that your inflatable boat is dry before storing it away. Molds thrive on moist and damp areas that do not receive proper ventilation. So to prevent the formation of molds in your dinghy, be extra wary in drying it up. Tip: Use dry towels for drying your inflatable boat. Always prepare more than 2 towels. Remove seats, bags, and other items from your dinghy. Next, use a towel to dry the outer part of your inflatable boat. Deflate the floor, and then tilt the boat sideways or upside down to drain excess water from the boat. Wipe out the remaining water in the boat. Use the towel to clean any debris, sand, or gravel in the boat. Deflate the rest of the inflatable boat. Use a different towel to continue drying up the boat. Check if there are any damp areas left. Roll it up and wipe as needed. A Lazy Hack: If it’s sunny out, you can leave your inflatable boat out to dry for a short period of time. After a while, flip it over to let the excess water drip out and to let the outer surface dry as well. You will still have to wipe your boat though, because the sun won’t take care of all of the water. This process is not recommended though if you have a PVC boat, since too much exposure to the sun’s UV rays can cause premature boat aging, fading, discoloration, and damage the coating and varnish. Once you’ve cleaned your boat and dried it, you will need to fold it up correctly before putting it awa for the winter. Step 1: Start by with deflating your inflatable boat. The valves should be in their “open” position for disassembly. While it is deflating, pull on the bow ropes. This will shape up your boat to make it easier to fold later on. Step 2: Close the valve. Leave a slight amount of air in the chambers to prevent the boat’s fabric from “scrunching” while it’s in storage. This is to prevent the fabric from damage due to the folds. Step 3: Pull up the side ropes as you deflate, to let the dinghy fold in properly. If the pontoons are not folding in, try pumping in a little air to repeat the deflation process. Do this repeatedly until you have desired results. Step 4: Now that the pontoons are deflated and folded, press on it to make it flat. Make sure the pontoons are not wider or bigger than the transom, in order for you to have an easier time rolling it up later on. Next, fold the cones in towards the transom. Step 5: For the final step, roll up the deflated dinghy starting from the transom. Fold the nose of the boat in, and voilá! You’re done folding your inflatable dinghy up! All that is left is to place the folded boat and other accessories on the carry bag. Fold and fasten the narrow flaps of the carry bag. Lastly, fasten the wider flaps. Fold the pontoons in, not wider than the transom. Roll up the boat, beginning from the transom. Fold the nose and finish rolling the boat. Put folded boat on bag, and then fasten the flaps. Avoid storing your inflatable boat in a humid environment. Moisture will creep in and cause mold. Store your boat in a well-ventilated area. Do not store it in a place where temperatures can reach extreme highs or lows. The garden toolshed that freezes during the winter is not a good option. Tip: If you’re storing it for a long period of time, you can pack your dinghy up with dryer sheets or moisture absorber like DampRid. Other options are putting packing silica gel or homemade desiccants with your boat to keep it dry.